I had never heard of a Cronut until a few weeks ago, when I was browsing Instagram and came upon a picture of one. I was intrigued. Introduced four months ago by Chef Dominique Ansel of New York City, a Cronut is a pastry hybrid — half croissant, half donut. A croissant-donut! How has no one ever thought of this before? Could there be anything more brilliant? The idea is so brilliant, in fact, that the croissant-donut has already spread across the world. Early last week, a buzz started among Jozi food and lifestyle bloggers. “Crois-Nuts” (not Cronuts, mind you — that name is trademarked) were coming to South Africa, via a high-end bakery on Athol Oaklands Road called Belle’s Patisserie. 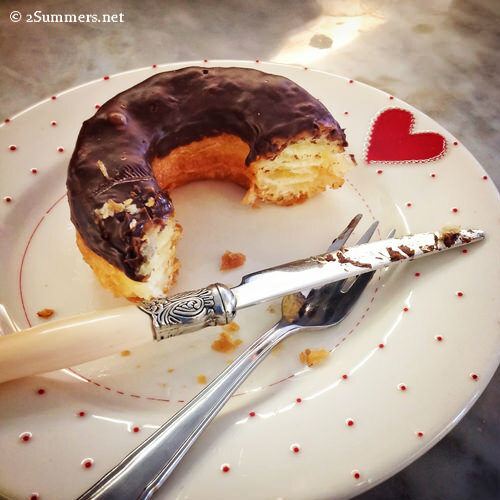 The Crois-Nut debuted at Belle’s last Friday. I’m not usually the type to run out the moment a new gimmick becomes available and buy it. But there’s something about this particular gimmick…I seriously considered driving to Belle’s at 7:30 last Friday morning and becoming one of the first people in South Africa to devour a Crois-Nut. But I restrained myself. Then I read my blogger friend Wisaal’s Crois-Nut post. My desire became overpowering. 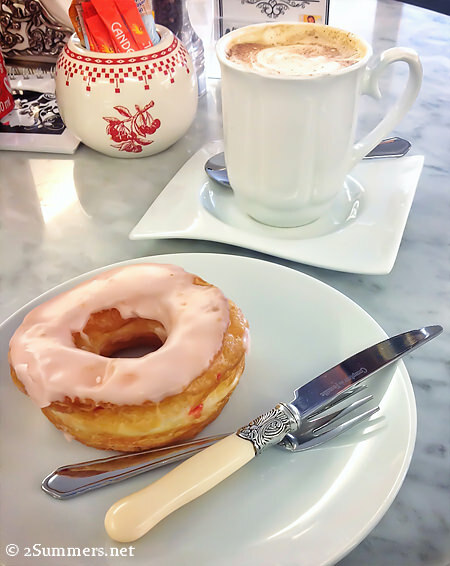 I made plans to meet my friend Louise at Belle’s Patisserie today, at 11:00 a.m. By 11:15, I had a Crois-Nut in my tummy. I tried the strawberry Crois-Nut first, on a friend’s recommendation. It has strawberry filling inside. 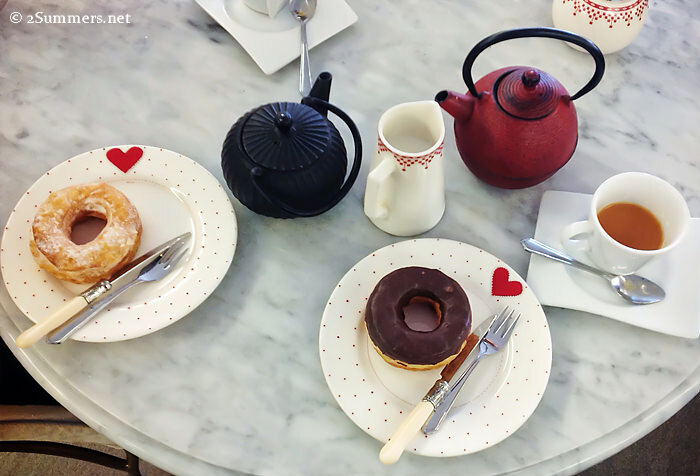 Crois-Nuts look pretty much the same as donuts, in both shape and presentation. But when I took my first bite, I immediately noticed the flaky, croissant-like texture. There is a pleasant, crackly-crispiness that you won’t find in a donut. The Crois-Nut is a croissant in donut’s clothing. I ordered the strawberry Crois-Nut and Louise ordered the custard one. Both were excellent and disappeared way too quickly. I immediately wanted more but was afraid of looking like a pig. I was relieved when Louise said she wanted another one too. Crois-Nuts, round 2. Louise got another custard. I went for chocolate. I really liked the chocolate and the custard but I think strawberry is my overall favorite. There’s also a plain version but I didn’t want to spend R25 ($2.50) on anything plain. My only complaint about the Crois-Nut is the name. It’s awkward — the word looks weird on paper and doesn’t roll off the tongue. With all due respect, I propose that the Crois-Nut be renamed the KwaNut. That’s the way the word is pronounced anyway, and it looks much more South African. I think I’m rambling and this post doesn’t make much sense. The sugar has gone to my brain. But stiill, I hope the folks at Belle’s will consider my proposal. Either way, I highly recommend a Crois-Nut (KwaNut) pilgrimmage. Kwaaaaa! Belle’s Patisserie: Blubird Shopping Centre, Athol Oaklands Road, Birnam. I still don’t know if I understand the hype around this cronut but it sure has spread all over the world! It seems like it’s basically a croissant but in a donut form? Kwa also looks like a very Americanized pronunciation of the French word “quoi?” which means “what?” That’s how I’m reading it anyways! Oh those look SO DELICIOUS! !! That’s actually a great idea. I definitely saw croissants there…not sure if there were regular donuts. But there should be! You have my support for the Kwanut! Thank you for agreeing with me. It makes so much sense. Looks and sounds quite tasty. That’s a hard hybrid to top. But, yes, the name is awkward–and definitely kwanut is MUCH better!